This fixture could not have come at a better time. Both Arsenal and Manchester United are in the form of their life. Arsenal have won four of their last four away games and Manutd have won four of their last four home games. From a neutral perspective, this match has got all it takes to be a season best. This match is the definition of goals. But, the odds seem to be slightly tilted towards the home side. Manchester United have scored the most number of goals in the Premier League even though they have played fifteen, one less than Arsenal. On the other hand, Arsenal have kept only four clean sheets out of a possible sixteen. This indeed is worrying from an Arsenal perspective. Arsenal now have to score more than the highest scoring team in their own home ground whilst providing a top defensive display. Can Arsenal do it? Only time will tell. Koscielny vs Berbatov: Having never played Manutd before, this match-up is hard to predict. Koscielny is alright with his aerial ability although I would have preferred Djourou against Berbatov. I don’t think Wenger will listen to me though. If Koscielny can keep up with Berbatov aerially, I believe Koscielny will be at an advantage. This is because Koscielny is best at anticipating and tackling. I also believe he can cope with Berbatov’s pace which is not very high. What Koscielny has to be aware of is Berba’s killer instinct near the goal. A lot of low crosses will be played from both sides with the help of Nani and Park(possibly) and Koscielny will need to man-mark the striker really well. Squillaci vs Wayne Rooney: I am most worried about this match-up. Unless we are really lucky and/or Rooney is completely out of form, I cannot see Squillaci effectively defending against the Englishman. Squillaci is slow. His tackling is so-so and aerially he his horrifying. Moreover, his partnership with Koscielny has yet to take off. If Arsenal are to lose/draw against Manutd on Monday, Rooney might as well be the reason for it. To cope with him, Squillaci has to be at the top of his game and Wenger has to apply some major tactics. Squillaci will not get away with it if he repeats the same errors that he made against Fulham and Partizan. Their strikers were lethargic, Wayne is not. Rooney will punish Squillaci cruelly for every mistake he makes. Clichy vs Nani: This one can go either way. It depends on which Clichy shows up on Monday. Will it be the Clichy with the awesome tackling ability or will it be the absent-minded, error prone Clichy we occasionally see? Clichy can match Nani with his speed but it will be his awareness and tackling precision that determines who wins the duel. I say tackling ‘precision’ because Nani will be up to his tricks and everytime Clichy makes a bad tackle he will give away a free kick. And, we do not want to concede free kicks to the likes of Berbatov, Rooney and Vidic, especially when Nani will be taking them. Let’s just hope the right Clichy shows up on match day. Sagna vs Park: This is one duel I am fairly confident about. The only thing that Sagna needs to be wary of is Park’s movements off the ball. That Korean can make some deadly runs and Sagna has to make sure that the Park-Evra combination does not work. But, I think out of all the Arsenal defenders, Sagna is the most dependable and I expect him to do his job. Manchester United will be up for the game but so will Arsenal. To hide some of our apparent frailties, we have to dominate the game well. We have to make sure the ball is on the right side of the field most of the time. Manchester is a counter attacking team and I hope our players are training accordingly. This is not a run of the mill fixture; we have to do much more than we did against the likes of Fulham and Partizan. Manchester United will be looking to take advantage of every mistake we make and we have to always be one step ahead of them to win. First of all, the recent Arsenal injury news has been driving me nuts. At the end of November, Eboue’s injury looked serious and we were told that he would out for 4-5 weeks. He then returned just a game later. Koscielny’s injury scare was even worse, as it was thought he would be out until the New Year. Now he seems to be fit to face Partizan tonight. It’s great that our players are recovering so remarkably fast! However, do think of us fans when you tell us that a player is out for so long, it just increases our tensions! Djourou is also apparently taking no part in tonight’s game against Partizan because of a thigh problem. Although Wenger did tell us that they’re being ‘cautious’ more than anything else. It just also shows how important Djourou has suddenly become for our campaign this season. When Djourou was sent out on loan to Birmingham in 2007, I didn’t think he’d have a chance to break through into the Arsenal first team. He did play relatively well though, and then came back. His horrific knee injury then set him back again, adding doubts to his future at Arsenal last season. His transformation and rehabilitation after injury has really been superb. I don’t know to whose credit his revival should go to, but nonetheless, Djourou has been like a new signing to Arsenal this season. In all his appearances so far at Arsenal, he hasn’t done too much wrong. His performance against Fulham really did showcase his defensive capabilities, especially in the air. Arsene Wenger used the word ‘dominant’ to describe his game against Fulham last weekend. That really is the perfect word. Dominance is something we haven’t seen recently in the Arsenal defense, especially since Vermaelen’s absence from the first team. He’d probably still not make the first team on a regular basis after Vermaelen is back. Either Squillaci or Koscielny will partner Vermaelen at the heart of defence then. Atleast now we have a strong defensive cover that is dependable even on difficult matches. 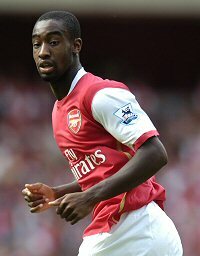 Djourou (if injury free!) should still get match time in the remaining Carling Cup games and also possibly be a regular starter for the F.A. Cup campaign next season. He really should use these games to build more confidence and put together a string of consistent performances under his belt. Arsene Wenger has seemed to put one of those stickers on him labelled ‘Fragile – Handle With Care’. He probably should be, but not to a large extent. If Djourou is to build into the quality world-class defender that we need him to be, then Wenger really shouldn’t hesitate or think twice before playing him. It’s time to put his injuries behind and treat him like a totally different player in the Arsenal ranks. One thing I am happy that Wenger hasn’t done with him is turn him into a DM, which Djourou himself had proposed to be a couple of years back after the departure of Flamini. That would’ve been disastrous as he really does look like a natural CB and I can’t see him playing anywhere else now. Finally, credit to Djourou for not turning into his erratic Swiss counterpart Philippe Senderos. Two thumbs up for Johan! The future for Arsenal just keeps looking bright.